The Lady orchid can be easily recognized by its long (30-60 cm), straight flowering stem. The flowers are densely compacted and are magenta to purple colours. If the plants has no flowers the it can be recognized by its bright, ovoidal leaves. The species is linked to the Quercus pubescens scrubs but it can be also found on grasslands, meadows and pastures. The range of the Quercus pubescens scrubs have been greatly reduced thus the priority habitats of this species as well. These forests were often sacrificed for the creation of vineyards and orchards, but relatively large populations of Lady Orchid remained in undisturbed areas or in steep hillsides areas. The restoration of Quercus pubescens scrubs and the creation of forest edges promote the maintenance of the species. 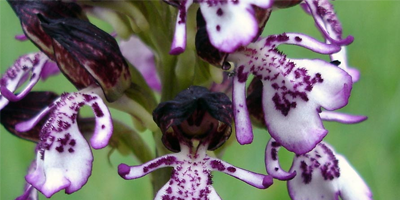 Lady Orchid can be found in the gardens around the Sas-Hill, thus it is not necessary to plant different kinds of alien species, but it is possible to preserve and maintain this protected species. This can be an example as how to simultaneously implement nature conservation management (maintenance of species of oak forest species) and recreational activities (gardening) by education and with a attention. For example, care should be taken not to cut non-flowering individuals and not to lead the species to be suppressed by other plants, thus, we can perform nature conservation management in our gardens!